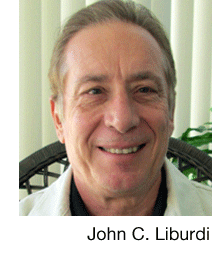 Liburdi joined the Navy to see the world in the mid-'60s. He soon jumped ship to join the Air Force for an exceptionally long military career. Upon retiring, John put out a couple of sensible books. But then he shifted to writing short pieces that depict our upside down world as seen through the eyes of mildly disgruntled seniors. His articles always contain warm nostalgia, wry humor, and happy endings. Andy Rooney would certainly applaud! John’s lighthearted articles are routinely featured in senior citizen periodicals throughout the country.